Please refer to our stock # LQS091502 when inquiring. 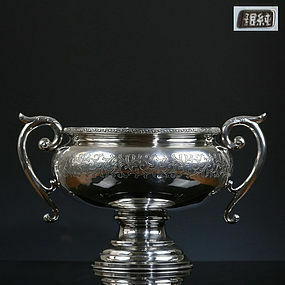 A stylish and elegant large silver vessel or urn, made in China around 1920s at a time when western goods were highly in vogue. The shape is inspired by Greecian urns and the body surface is etched with detailed acanthus leaf scrolls. The bottom is marked "chun yin", meaning "solid silver".